Pros: An original, unique, hysterical and off the wall cabaret like none you’ve ever seen before. Cons: Slight lack of plot. An ingenious and original thrill ride of hilarity that grabs you by your ripped lederhosen from start to finish. I haven’t stop talking about this show since I had the pleasure of experiencing it earlier this week. I’ve been giggling and smirking quietly to myself at every chance I get and I’ve even found myself talking in a pseudo-West Berlin accent. You kno vot I meen baby, yeah? The premise is simple. 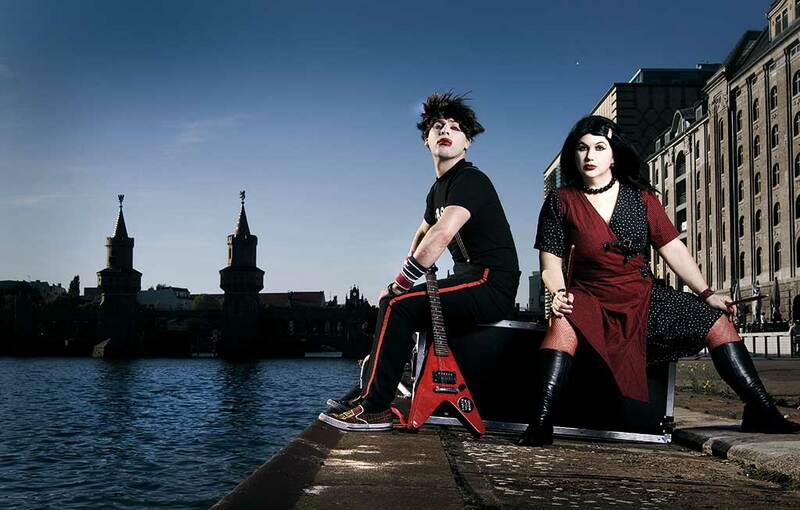 A brother and sister double act, Astrid and Otto Rot, are the faux-German rock band, Die Roten Punkte. Tonight is the band’s first ever London gig, and you have a front row seat to watch the spectacle fall apart in front of your very eyes. Imagine if Sally Bowles and the Emcee had a drunken one-night stand at The Kit Kat Klub: Die Roten Punkte would be the twins born from that drunken tryst – dramatic and dysfunctional superstar wannabes. These two siblings, with a penchant for squabbling and OTT eye-liner, will stop at nothing to ensure that their first London gig goes without a hitch. I don’t think I’ve ever been to a show where I’ve genuinely laughed so much it hurt. Granted, I’d had quite a few cocktails on an empty stomach, but I can honestly say that this show is one of the funniest things I’ve ever seen. The characterization by Australian actors Clare Bartholomew and Daniel Tobias is so well fine-tuned that it’s a sheer delight to watch. The comic timing between Otto and Astrid is a superb, well-oiled machine, having you in hysterics from the outset. Astrid wears the pants (or layers of pseudo-geisha silk in this case!) and berates the sensitive Otto while they both desperately cling on to their attempt at constant professionalism. It’s comedy gold. Astrid’s antics definitely stole the show for me. An incident in which she accidentally got wrapped, and wrapped, and wrapped in her mic cable while trying to perform a song was priceless. I’m not sure the moment when Astrid kicked over the speaker and it actually fell onto a table in the front row and wiped out all of those audience members drinks was part of the act, but even if it wasn’t, the way they improvised out of the whole situation is a testament to this duo’s immense talent. I’m not a massive fan of rock music, so was a tad wary when the songs started, but I got over myself within seconds. The lyrics may be a tad weak but the musical number are hilariously performed and catchy. The rock opera about how their parents died and then what happened next at the hands of their uncle is awkwardly funny, if a bit long. My personal highlight musically was Ich bin Nicht ein Roboter as this song encapsulated the duo’s energy, humour and sheer passion for trashy Europop. Hallo London, Berlin calling…. There’s not much plot, apart from Otto thankfully finding out he’s not the father of Astrid’s baby (cue the song ‘I Love You, And It’s Normal’) and at times, the show does seem all over the place. However these aren’t negatives as you are so drawn into the show that you actually forget that you are watching a very nervous rock band simply trying to perform their first London gig, which isn’t going quite to plan. Mein liebchens, if you love Spinal Tap and Best In Show, then Die Roten Punkt: Kunst Rock is for you. You will not be disappointed. Just make sure to avoid the front row, because you’ll either get a heavy speaker on your lap or catch Astrid’s eye, both of which are terrifying!